With a unanimous vote Tuesday morning, the University of Connecticut Board of Trustees appointed Thomas C. Katsouleas as the university’s 16th president. Katsouleas, currently provost and executive vice president of the University of Virginia, said he was “honored and humbled” to be appointed. He will take office Aug. 1. “I wish to thank you for placing your confidence in me. I will spend each and every day working to justify the confidence and meet your expectations in the years ahead,” he said. “He’s got great vision for this university and our state. He’s got the right experience. He’s got the grit,” Lamont said. Katsouleas was among more than 215 applicants for the position, which President Susan Herbst is leaving this summer when her contract ends after eight years in the job. An inventor and researcher who taught at the University of Southern California for 14 years, Katsouleas, 60, served as dean of the engineering school at Duke University for seven years before arriving as provost — the chief academic officer — at the University of Virginia in 2015. Katsouleas ‘s base pay will be $525,000 with a $50,000 performance-based incentive and $75,000 in annual deferred compensation at the end of each year. In addition, he will have housing at Oak Hill, the president’s house, access to the university’s house on Scarborough Street in Hartford, and a car allowance of $15,000. He’ll also receive $125,000 in a deferred payment after five years and an annual automatic increase in his base pay of 3 percent each year. That’s less than the current president, Susan Herbst, who served as president for eight years, is earning. She is eligible to earn a maximum of $899,967 this year, including a possible $40,000 bonus. Her base pay this year is $691,927. Herbst’s contract ends June 30 but she has agreed to stay on until Aug. 1, when Katsouleas will take office. 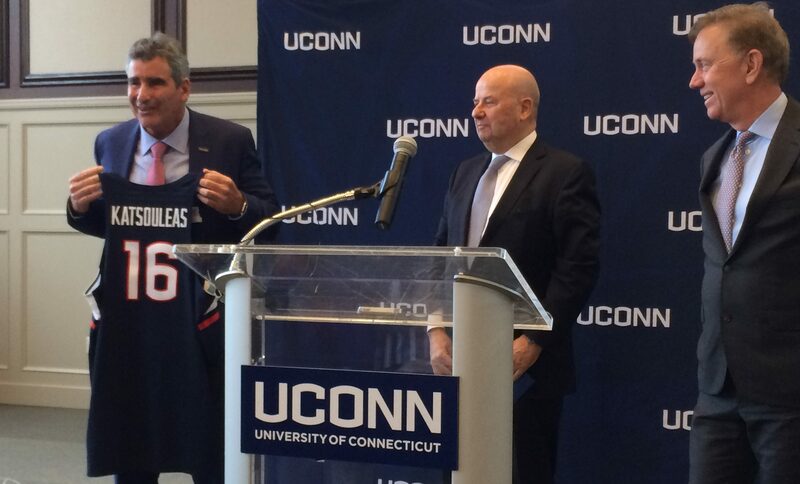 Katsouleas plans to spend a significant amount of time in Connecticut in the coming months, the university said, preparing for the job and working with Herbst to ensure a smooth transition. The trustees voiced strong support for Katsouleas before voting. 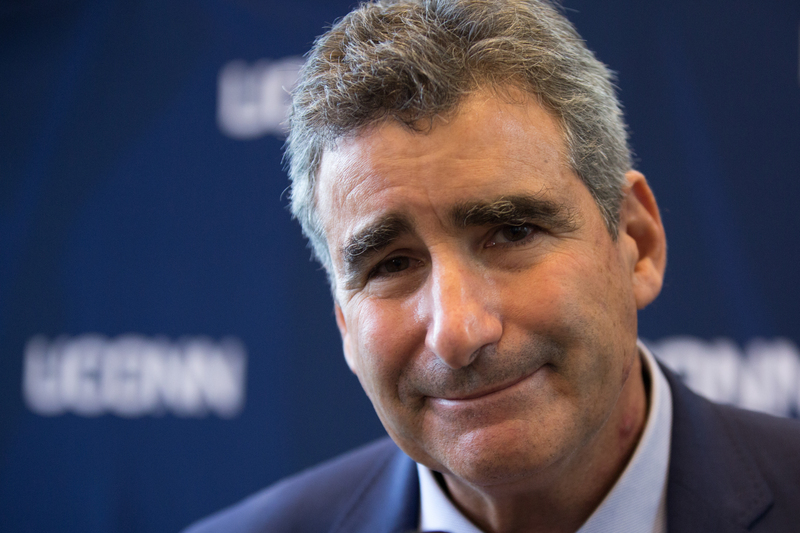 Katsouleas said Tuesday that he plans to focus on supporting innovation, enhancing the university’s connections with alumni and philanthropic supporters, and capitalizing on the state’s investments to aggressively expand UConn’s impact on the economy and and innovation. Katsouleas said it will be important for him to ensure the university’s priorities are aligned with priorities of the state. He noted that in a Jan. 28 meeting with Lamont and state business leaders he learned how important UConn is to feeding the state’s supply of engineers. He said many of the business leaders told him that more than half of their workforces were UConn grads. One of his top priorities, Katsouleas said, is growing research at UConn. He has set a goal of doubling research dollars at the university over the next seven to 10 years, from the current $265 million to $500 million. “Good public universities are pillars supporting their state – serving its needs and supporting its economy,” Katsouleas said. But, he added, great flagship universities do even more. Katsouleas also said he expects to spend a lot of time working with the UConn Foundation, the university’s fundraising arm. But Katsouleas emphasized that students are at the center of his mission and said he expects to have regular office hours with them at a local coffee shop where he will be doing the buying. “Take me up on the coffee offer, OK?” he said to a student. Katsouleas’ departure from UVA had been planned since shortly after the president who hired him, Teresa A. Sullivan, announced her intention in 2017 to resign. He has two physics degrees from UCLA, earning a B.S. in 1979 and a Ph.D in 1984. He began a career in teaching and researching physics, electrical engineering and computer science at the University of Southern California where he became an associate professor professor of electrical engineering in 1991 and full professor in 1997. Katsouleas was one of three publicly identified finalists last year for president of the University of Utah, a school with a search process more public than UConn’s. The university’s search committee worked in confidence and did not identify either of the two finalists interviewed by Lamont the weekend after he took office on Jan. 9. Lamont was initially noncommittal about the candidate, but invited Katsouleas back for an unusual vetting session with prominent business leaders on Jan. 28 to talk about the new governor’s desire for UConn to take a stronger role in driving economic growth in Connecticut. During a short news conference with reporters following the trustee vote, Katsouleas was asked if he is committed to keeping a Division 1 football program. Katsouleas grew up in southern California where he was a surfer, a sailor, and a lifeguard who loved “anything to do with water,” he said in an interview with UVA’s alumni magazine. He has two children who live in California, but Katsouleas said they will be spending their vacations in Connecticut. His oldest child, a high school junior, is looking at colleges, he said, and will include UConn on the list.